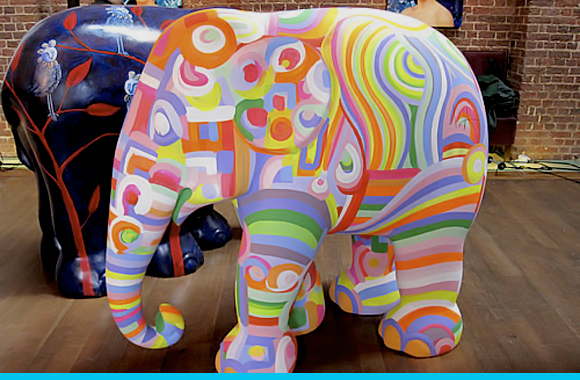 London has been invaded by more than 250 multicoloured elephants. The model elephants are part of a public art exhibition to raise awareness of the plight of elephants around the world. Each model, the size of an adolescent elephant, has been decorated by an artist/celebrity before they take part in a big Elephant Parade. I spotted several Nellys on my walks around the big smoke at the weekend. They are due to be auctioned off to the highest bid at Sotheby’s to raise funds for the Elephant Family charity. Caroline Lucas – gives an alternative Queen’s speech. Make sure to click the tinyurl at the bottom to see more of the Green MP on the Channel Four website. Business Green – on India’s plans to to introduce a renewable energy certificate (REC) scheme to encourage investment in low-carbon projects. George W. Bush – at the American Wind Energy Association’s conference talks about the US energy transition. The Economist – on the biggest conservation deal in history. And finally the Guardian’s Adam Vaughan warns that despite the success in halting a third runway at Heathrow, the regional airports have plans to expand. The vast majority of people who have been tracking the BP oil disaster by watching television news or reading online/newspaper commentaries will admit that it has been a tricky story to follow. It has now been four weeks since the pipe burst in the Gulf of Mexico. And yet only now is the truth starting to emerge. It is still very much a “live” story. To their credit, the people over at The Oil Drum have recognised the need to put together some sort of “beginners guide” feature on the Oil Spill. They have also given a background on related issues including the supply and demand of oil during turbulent financial times, peak oil theories and energy alternatives to the “black stuff”. Well worth a read.